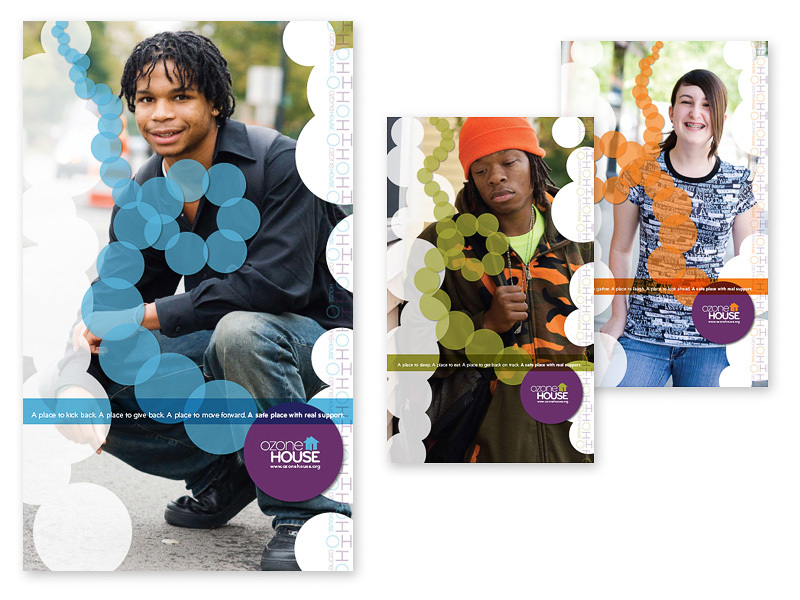 Ozone House posters designed by Pryor Design Co.
I’m a not-so-closeted matchmaker, and I love bringing people together. One of the most inspiring partnerships I’ve fostered was Pryor Design and Ozone House. And even better, I got to participate in their resulting collaboration in a peripheral, yet highly visible way. According to its website, “Ozone House is a community-based, nonprofit agency that successfully meets the needs of runaway, homeless, and high-risk youth and their families. Ozone House’s high-quality programs and services provide safety, housing, counseling, support, training, and leadership development for youth and families who otherwise have nowhere else to turn. Through these services, all of which are free to youth and families, Ozone House helps youth develop essential life skills, improve their relationships, and enhance their self-image so that they may realize their full potential for growth and happiness.” Learn more. Now lest you think I’m some sort of saint, be advised that this wasn’t a completely selfless set-up. I had previously agreed to donate my photographic services to Ozone House, an inspiring nonprofit organization with less-than-inspiring visuals in their communication materials. And while my donation wasn’t conditional, understandably my preference would be that my photography be used to the greatest possible advantage for Ozone House. Sue Upton, development director of Ozone House who originally contacted me, described the challenges the organization faced in reaching its different audiences. I could plainly see that the agency needed much more than good photography — it truly needed (and deserved) the services of a talented communication designer. Now, if I could choose one designer who was up for the challenge, I’d easily choose Scott Pryor of Pryor Design. Not so coincidentally, he really likes my work, too. Sue got Pryor-Design fever straightaway (as anyone looking at their impressive body of work would). Unsurprisingly, Scott Pryor was already involved in a sizable pro-bono project, and it happened to be with the Shelter Association — an agency closely related to Ozone House. Months later, after the Shelter Association project wrapped up, Scott learned more about Ozone House. He was impressed both by the agency’s unique and critical mission, and by the people who devote themselves to fulfilling it. He wholeheartedly agreed to donate his services. It took a little time, but everything fell into place. Ozone House’s new website (under development) and new logo, both designed by Pryor Design Co. The early stages of the partnership have been successful. Scott and his associates, Chris Wisniewski and Laura Hervey, have substantially upgraded Ozone House’s visual identity, and the new website is currently under development. The portraits I had taken of Ozone House outreach workers last fall in Ypsilanti were being beautifully integrated into the new designs. A few weeks ago I got word from Scott that additional portraits were needed to round out a series of posters — posters, I say! So we set up another photo session, this time in downtown Ann Arbor. The posters rock! They will be 18x30″ and printed in full color — I can’t wait to see them. I’ve learned they will be unveiled at an open-air benefit dinner for Ozone House at the Farmer’s Market on Friday, September 19th at 7pm. I will most certainly be there, as will Scott and his wife Deanna. If you’d like to be there, too — to celebrate local food and local chefs at a beloved local venue and to support an important local cause — there are still seats! Tickets are $75 per person. RSVP ASAP (pdf). The overall goal for the creation of these was to present (in a few seconds) what Ozone House stands for. By way of overall identity, messaging and the wonderful photography, we wanted to quickly personify how special this place is. Used first as posters, we also see some variation of these being used as print ads and other general-use items. The posters themselves will be produced in a way that will allow them to be easily displayed at the many events that Ozone House presents throughout the year. Conceptually, we felt it important to feature the people behind Ozone House, but in a way that illustrates how uplifting a place it is. Typically such entities tend to use sorrow to beg people into involvement or association. Doing so in this case didn’t seem right. By way of color, tone, photography and overall form, the posters themselves (we like to think) create a journey of inspiration. Using the circle from the logo, each of the posters literally features an inspiration trail that leads to Ozone House. This trail represents the oftentimes challenging journey that ultimately brings people to Ozone House, which is, as the tagline states, “A safe place with real support.” Building upon the tagline, we also developed messaging that more specifically describes Ozone House: “A place to kick back. A place to give back. A place to move forward. A safe place with real support.” Again, the messaging supports the journey, and it does so in a way that resonates with the varied audiences. Above all, working with the staff at Ozone House has inspired us just as much as doing the work itself. We truly cherish the opportunity to work with such great people in support of such a worthy cause. Always proud to see you doing great deeds. The posters will be spectacular and monumental in many ways. Keep on climbing the mountains!! !